Before we get into the awesome new looking campaign mode, lets get some announcements out of the way. 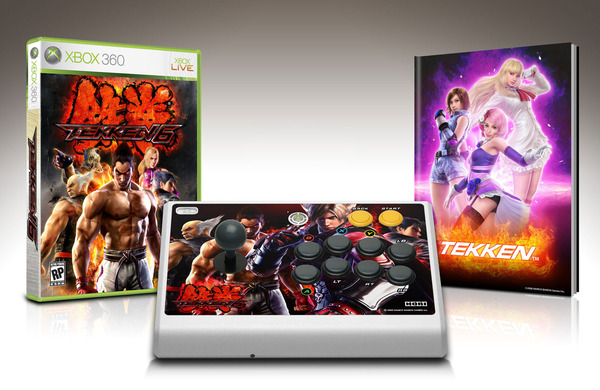 Namco-Bandai has announced an October 27th release date for Tekken 6 on the Xbox 360, PlayStation 3, and PSP. For the truly dedicated fan the Fight Stick bundle will be available for $149.99 and contain the game, a wireless Hori fight stick and a limited edition art book. Tekken 6 will also feature the Cardboard Tube Samurai from the popular Penny-Arcade webcomic. So why are we talking about a fighting game on a co-op website? Well my friends that's because we got a good look at the new Co-Op Campaign mode in the game, and it looks like a classic co-op beat em up. The latest video from the PlayStation Blog showcases the two player online mode. Fighters will work through linear stages beating up baddies with a friend (or AI). There's plenty of weapons to pick up as well, and you won't just be fighting henchmen. In one scene we see both players working to take down a giant robot. There's no word on the length of the co-op mode, as it is described as "scenarios," but the short video shows quite a few different locations. This one is definitely on our co-op radar now. Page created in 0.4529 seconds.